DIMONA, ISRAEL (ANS) — January 26, 2018) — After opposition shut down a meeting center for Messianic Jews in southern Israel last May, ultra-Orthodox Jews are harassing it again since it re-opened this month, sources said. 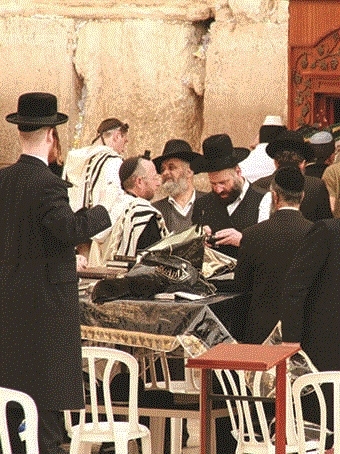 According to Morning Star News, ultra-Orthodox Jews protested the presence of the center in Dimona, Israel, on Tuesday (Jan. 23) and threatened some of the Messianic Jews, followers of Jesus, according to advocacy group Middle East Concern (MEC) — http://www.meconcern.org/. “Protests have taken place the last two weeks after the reopening of the center at the beginning of January,” according to a MEC press statement. The center, where Messianic Jews meet for conversation, coffee and tea, had been temporarily closed last year due to protests by ultra-Orthodox Jews on May 4, 2017, after which they damaged Messianic Jewish leaders’ homes, breaking windows and traumatizing two children inside one home, one of the leaders told the Messianic news outlet, Kehila News Israel. Knoester, of Nachalat Yeshua (Yeshua’s Inheritance) congregation, said that not long after protestors secretly filmed the Messianic Jews at a Town Hall meeting last year, demonstrators including members of the ultra-Orthodox Yad L’Achim showed up at his and house and did more damage, including smashing windows. Those incidents, however, led to townsfolk on the street inviting them for drinks to talk, he told Kehila News. Morning Star News went on to say that local media have misrepresented the center as a “mission post,” and false reports including accusations of bribery for conversion to Christianity have also led Jews to talk with them, he told the news outlet. A group of rabbis showed up to interrogate them, he said, and when his wife Esther responded with verses from Psalm 23, they agreed to temporarily close the center while continuing to discuss what place the “Open House” should have in the community. In the following days local media began a slander campaign, he said. Besides the bribery accusation — that they would offer a car in exchange for converting to Christianity — they were accused of putting a powder in people’s coffee “to change Jews into Christians,” and of coercing Jews to convert by force, he told the news outlet. In Tel Aviv, a Bible Society bookshop is under threat of being shut down. The owner of the bookshop’s building alleges that the Bible Society is violating its commercial license by selling Christian literature, other than Bibles, and therefore should not have protected tenant status, according to MEC. The shop has been in the same location for 55 years. On Wednesday (Jan. 24) two representatives of the Bible Society in Israel went to court to give testimony, but the judge did not appear due to illness, and the case has been postponed to an as yet unknown date, MEC said in a statement. In Bethlehem, where two nuns and their convent in the Palestinian Territories were attacked last year, a policeman appeared to be altering the facts in his testimony at a hearing on the case on Monday (Jan. 22), according to MEC. 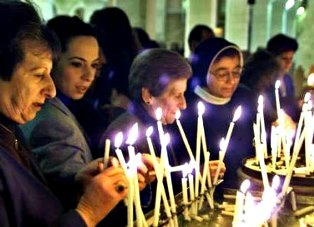 On April 30, 2017, a woman identified as a member of the Mahatna family, which has taken over part of St. Mary’s Coptic Convent, broke into its storeroom and physically assaulted a nun identified only as Sister Maria, besides damaging the property. While the nuns were on the way to a police station to file a complaint, the alleged assailant’s brother, Rami, and a friend stopped their car and struck it with an iron bar, unaware that a police officer was inside the car, MEC reported. A lawyer representing the nuns has asked for damages to the car to be examined by an expert and presented as evidence. The next hearing is scheduled for April 9th of this year. The Mahatna family has illegally taken up residence in part of the convent building, according to MEC. At a prior hearing on Monday (Jan. 22) regarding the alleged assault on Sister Maria by the Mahatna family member, identified only as Rania, a judge appeared sympathetic to medical reports on the nun’s injuries, according to MEC. A final hearing is scheduled for March 23. “Prayer is requested that the judges will examine the cases fairly, and that justice will be seen to be promptly done; and that the Mahatna family members will stop harassing the nuns and move out of the convent premises,” MEC said in a statement. Photo captions: 1) Ultra-Orthodox Jews attacked a Messianic congregation. 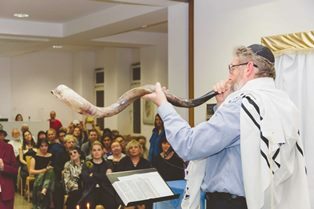 2) Shofar (a ram’s horn trumpet used by ancient Jews in religious ceremonies and as a battle signal, now sounded at Rosh Hashanah and Yom Kippur), being blown at a Messianic service. 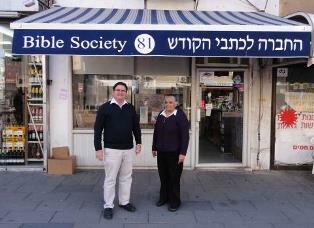 3) The Tel Aviv Bible Society bookstore. 4) Palestinian believers lighting candles in the Church of the Nativity in the biblical West Bank town of Bethlehem. 5) Dan Wooding outside the Church of the Nativity. About the writer: Dan Wooding, 77, is an award-winning author, broadcaster and journalist who was born in Nigeria of British missionary parents, Alfred and Anne Wooding, and is now living in Southern California with his wife Norma, to whom he has been married for nearly 55 years. They have two sons, Andrew and Peter, and six grandchildren who all live in the UK. Dan has written numerous books, the most recent of which is Mary, My Story from Bethlehem to Calvary (http://marythebook.com/), a novel about the life of Jesus through the eyes of his beloved mother. He has reported from Israel, the West Bank and Gaza, on many occasions.